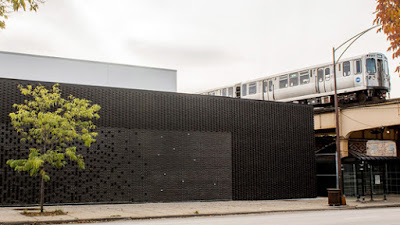 CHICAGO (November 2, 2018)—The University of Chicago announced today the opening of the Green Line Performing Arts Center, providing a vital new theater venue and rehearsal space to support the arts in the Washington Park neighborhood and across Chicago’s South Side. “The Green Line Performing Arts Center is an important University of Chicago initiative, done in partnership with the South Side community that will create a wide range of artistic opportunities on the South Side for small and community-based theater companies. It is an investment that reflects both the need for such arts-related opportunities and the important role that the arts can play in enhancing communities and their development. We are grateful to our philanthropic partners for joining the University in our strong commitment to supporting Chicago’s rich cultural community,” said Robert J. Zimmer, president of the University of Chicago. The Green Line Performing Arts Center will host a free, public Opening C­elebration on Saturday, November 10 from 2-6 p.m. The event will include performances by local artists, including Bomba con Buya, avery r. young and de deacon board, and Honey Pot Performance. For a schedule of Center events and programs, visit arts.uchicago.edu/glpac. In its inaugural season of programming, the Green Line Performing Arts Center will host the GreenLight Series, illuminating the varied performing arts disciplines and inviting audiences to experience a rotating sample of storytelling, music performances, comedy, theater, and dance works presented by artists. The GreenLight series will showcase Grown Folks Stories on Thu. Nov. 15, 7-9 p.m.; South Side Story Time on Sat. Jan. 19, 10-11 a.m.; and In The Spirit on Sun, Feb. 17, 10-11 a.m. Other programs will include APL’s First Monday Jazz Series with Junius Paul Quartet on Mon, Dec. 3, 7-9 p.m. and Vends + Vibes: An Arts Marketplace, Dec 8-9, 12 noon to 5 p.m.
Arts + Public Life (APL), an initiative of UChicago Arts, provides platforms for artists and access to the arts through residencies, education, cultural entrepreneurship, and arts-led programs and events. APL advances and promotes a robust, collaborative, and evolving relationship between the University of Chicago and the South Side’s vibrant civic, cultural, and artistic communities. APL creates cultural amenities and preserves affordability and authenticity through arts and culture-led neighborhood development. APL continues to share this work by participating in local and national conversations around effective, creative alternatives to conventional financial and development strategies, promoting mindful city-building and equitable neighborhood transformation. The Green Line Performing Arts Center is part of the Arts Block, a vibrant collection of cultural and commercial spaces on historic Garfield Boulevard. The Arts Block combines University-led initiatives, programming produced by cultural organizations, and both philanthropic and private investments. Additional spaces on the Arts Block include the Arts Incubator, Rain Garden, and historic CTA station, currently being renovated to support cultural entrepreneurship, all projects of Arts and Public Life, as well as, Peach’s at Currency Exchange Café and BING, projects of the Rebuild Foundation. UChicago Arts encompasses the University’s robust cultural scene where scholars, students, artists and audiences converge, explore, and create. UChicago Arts maintains an ambitious suite of initiatives and programs to enhance the cultural landscape at the University of Chicago and on Chicago’s South Side, including Arts + Public Life and its flagship project the Arts Incubator, the Arts, Science & Culture Initiative, the Richard and Mary L. Gray Center for Arts and Inquiry, and the Reva and David Logan Center for the Arts. Joining academic departments and programs in the Division of the Humanities and the College, as well as professional organizations including the Court Theatre, Oriental Institute Museum, Smart Museum of Art, Renaissance Society, and University of Chicago Presents, and more than 60 student arts organizations, UChicago Arts is forging an integrative model for practice, presentation, and scholarship. Image credit: Green Line Performing Arts Center, photo by Jean Lachat/University of Chicago.